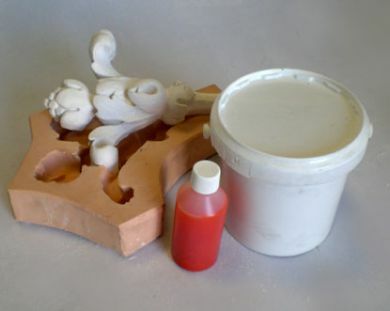 Lukasil 429 is a general purpose room temperature vulcanising (RTV) silicone rubber. It is medium/soft (20 shore A) with high detail, good elongation and tear strength. It comes with a coloured 10% catalyst which once mixed with the white base rubber will make it cure through any thickness withing 24hrs. It is a pouring rubber but can be thickened by the addition of ½ to 1% our Thixo Additive. For brush/bench clean up use white spirit.